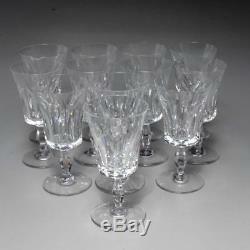 A vintage set of 12 Baccarat crystal Polignac claret wine glasses. 5.75"h and 2.75" diameter at the opening. There are light surface scratches and light wear marks on the bottom of the glass. All the glasses are acid etched on the bottom with the Baccarat France hallmark. Please see the other glasses we are offering in this pattern. Visit our store to see our complete selection of offerings from several categories including antiques, jewelry & handbags, sterling silver, porcelain, and more. Auctiva offers Free Image Hosting and Editing. The item "VINTAGE SET OF 12 BACCARAT CRYSTAL POLIGNAC CLARET WINE GLASSES" is in sale since Tuesday, March 20, 2018. This item is in the category "Pottery & Glass\Glass\Art Glass\French\Baccarat". The seller is "whiteroomauction" and is located in Boonton, New Jersey.